IDENTA LC Microhybrid Composite Flow is a flowable, light-curing and radiopaque glass ceramic microhybrid composite. It is suited for filling anterior and posterior teeth. 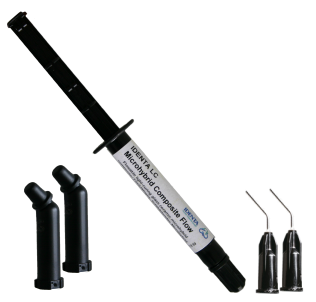 Due to its low viscosity IDENTA LC Microhybrid Composite Flow provides good wetting and adaptation to tooth substance. IDENTA LC Microhybrid Composite Flow can be polished to a high gloss and exhibits high material strength and colour stability. LED and halogen lights are suitable for polymerisation. IDENTA LC Microhybrid Composite Flow contains 64.0 % inorganic fillers (highly disperse silica), submicron filler particles of 0.7 µm mean grain size (barium/strontium borosilicate), and dimethacrylates (Bis-GMA, urethane dimethacrylate, triethylenglycol-dimethacrylate). IDENTA LC Microhybrid Composite Flow is available in three shades (A2, A3, A3.5).